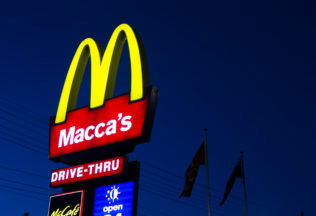 McDonald’s Australia has commenced their planned three year national expansion, with 45 new restaurants approved nationwide, and refurbishment plans for many current locations. Senior development director Josh Bannister said $500 million has been allocated to the expansion, with new restaurants planned for growing areas and major thoroughfares across Australia. In spite of property prices, Mr. Bannister has confirmed that McDonald’s will continue their freestanding restaurant model, favouring land ownership rather than leasehold relationships. “We own two in every three restaurants we open” said Mr. Bannister. The expansion in growing and rural areas across Australia is consistent with, and surely follows, an Inside Franchise Business report that suggests ‘fast-food and eating out’ made up 34% of total household food expenditure.